On the 5th day of Tech-Mas my true love gave to me… five golden nuggets. When I used to be a technology director, "getting a quote" meant asking a vendor for the latest pricing for CAT5 cables or Chromebooks. Since I have been a technology integrationist, I now get to focus on the other meaning of "quote" … a short, but thought-provoking statement. A quote takes a complicated concept or inspiring idea or reflection on the human condition, and condenses it down to a few powerful words. When you dig into a quote, you find there is much more there than meets the eye. Like Doctor Who's TARDIS, quotes are bigger on the inside. I have a love of quotes in all areas of my life including my profession… educational technology. 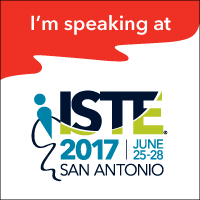 I am always excited to catch a golden nugget shared by an educator in a Twitter post, a blog entry, a book, or a live presentation. 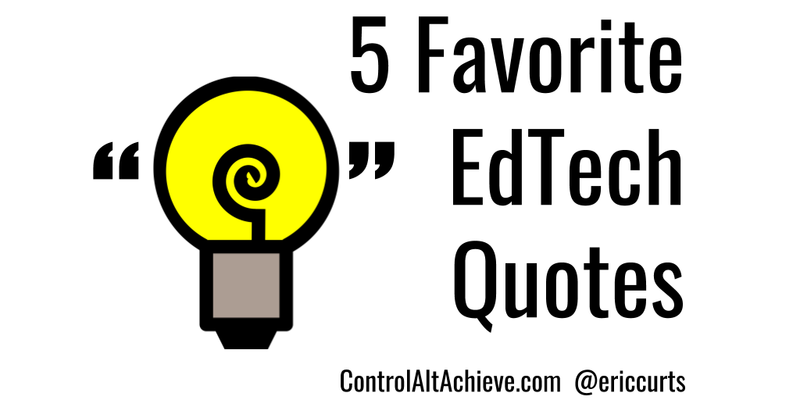 For this blog post I have chosen five quotes that have resonated with me when it comes to teaching, learning, and technology. Certainly there are way more than five quotes I could have chosen, and maybe in the future I will do follow-up posts with more. I kept it to only five though because I don't want to just share the quotes, but wish to dive a little deeper. For each quote I have created a graphic and written a short response about my own thoughts. I hope some or all of these will inspire and encourage you, as they have done for me. Please feel free to share some of your favorite education and technology quotes in the comments at the end of this post. I would love to read them! Consider this… Let’s say you need to send out a newsletter or give a speech or do a presentation. If you know there will only be a handful of people who are going to receive your memo or listen to you talk, you will do a good job, but perhaps not your absolute best. Life is busy and we are pulled in a dozen different way at any one time, so we do what needs to be done and quickly move on to the next pressing task. But now let’s say your audience is different. That article you are writing is going to be published in a magazine or an online site read by tens of thousands of people. Or that presentation you are giving is the keynote and hundreds of attendees will be focused on you and your words. Oh yeah, and it is being recorded so anyone can watch the video in the future. Hmmmm. 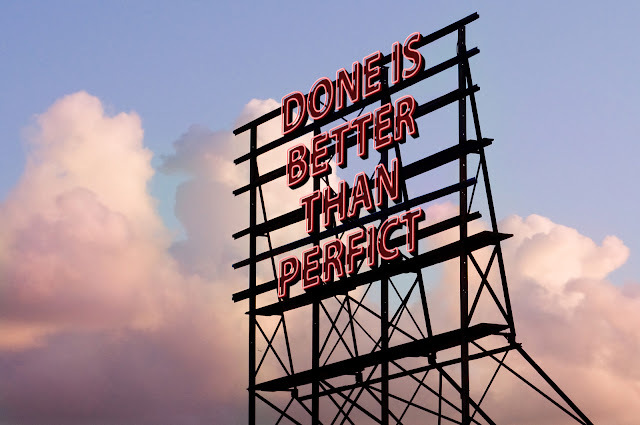 Do you spend a little more time writing, and tweaking your words, and revising the final product? Of course you do. And the same is true for our students. When your students write, who is their audience? Many times it is an audience of one. Just you. What they write is going to be read by their teacher, graded, handed back, and that’s it. End of story. How much motivation will our students have in such a situation? Just enough. Just enough to get the grade and satisfy the requirements of the assignment. So how can we change this and help provide more motivation for our students to do the best they can when writing, speaking, or creating anything? One option is to provide them with a larger, more authentic audience. Technology gives us unprecedented tools for collaboration and communication. 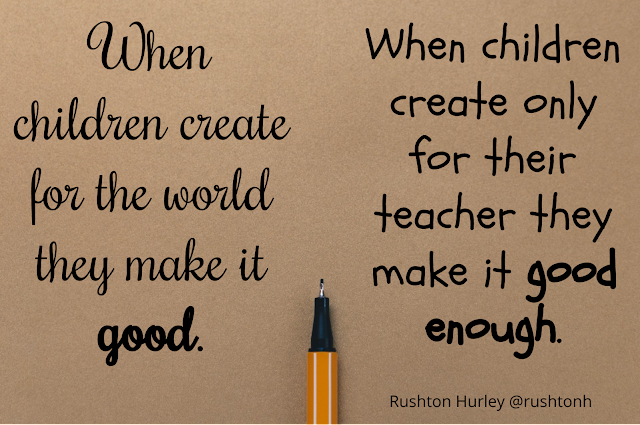 Instead of just writing for their teacher, students can be creating for the world. This quote by Rushton Hurley always reminds me that we need take advantage of technology to get our students' work in front of more eyes, including peers across the hall as well as around the world. Instead of just the "red pen comments" of their teacher, students can get feedback from multiple people and perspectives. And with a larger, more authentic audience comes motivation to write and rewrite, to make their work as good as they can. When I was a student (many, many years ago) I dreaded class participation. Now don’t get me wrong… I loved school. I was a model student who excelled in all my subjects, loved to learn, and took the most challenging courses. I just didn’t like to talk. You see, from the time I was a little child into my early teen years, I used to have a stutter. Some days were better than others, but one thing that always brought out the stutter was speaking out loud in class. When a teacher asked a question, I most always knew the answer, but was hesitant to raise my hand. And nothing was worse than the teacher having each student in class take turns reading from the chapter in the textbook. The closer it got to me, the more nervous I became, trying to determine which paragraph would fall on me and which words I would undoubtedly stumble over. Perhaps they wrestle with a speech impediment. Maybe they fear they do not have the right answer or a valuable contribution. They just need more time to think before they are ready to answer. Or maybe they are shy. It could be that they are skilled in other areas such as art, music, design, or writing, and could express their understanding much better if allowed to do so in a different medium. Thankfully today technology provides us with many tools for students to participate in class, share their ideas, ask questions, and explain their understanding. 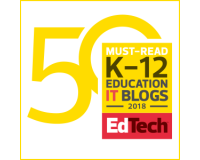 Students can communicate through backchannels, email, Google Forms, Classroom stream posts, recorded videos, slideshows, stories, diagrams, animations, songs, and much more. We often teach the way we learn, but we need to remember that our students do not always learn and communicate the same way we do. 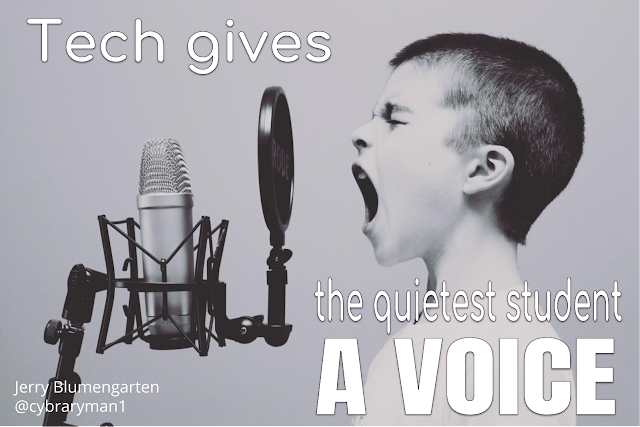 Technology can give choice and voice to all of our students, so everyone can learn, create, and communicate. In life in general, and with technology in specific, you can’t know everything. Technology is a moving target, always introducing new tools and features. If you are going to use technology effectively, you have no choice but to be a life-long learner. One of the first steps is to admit there is a hole in our tech knowledge. Some people think the three toughest words to say are “I love you” but many times they are “I don’t know.” Especially when we are in positions of authority, we feel we can’t admit we may not know everything. We think we may look stupid or unqualified or unprepared. In fact what we will look like is a learner. 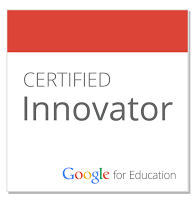 A few years ago, when I served as one of the leaders at a Google Teacher Academy, we were not called leaders. Instead we were titled “Lead Learners”. I love that mindset! 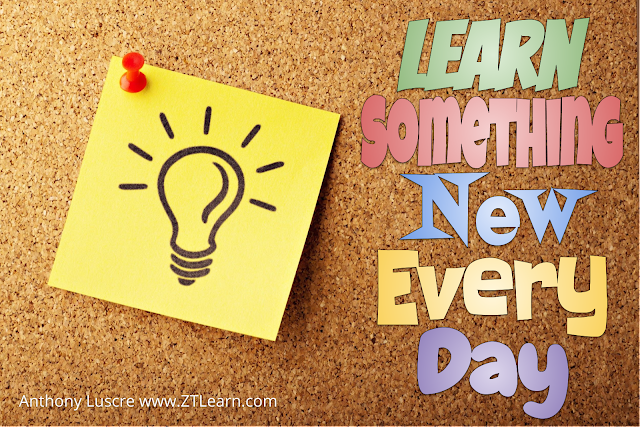 We should always hope to learn something new, even when we are the ones leading the professional development. I would go so far as to say if you are not learning, then you really are not engaging your audience, but are just on autopilot giving a lecture. If you want your audience (teachers, students, etc.) to learn then you need to model a growth mindset, have a desire to discover, and "learn something new every day." I've been doing this education thing for a while now. 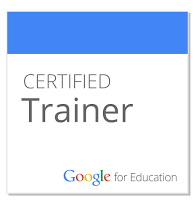 As of the time of this writing, I am in my 26th year as an educator. I have always been a person to share the things I created, whether it be through a website or a podcast or a conference. However, two years ago I decided to concentrate all my efforts in one location, so I created this Control Alt Achieve blog. 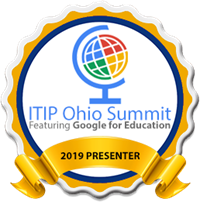 Over the last two years I have seen a surprising and significant increase in connections through Twitter and other social networks, requests to speak at schools and conferences, and visits to the blog. As awesome as that is, it is also a challenge. Now that a bunch of people are watching, what should I do? The best words of wisdom I have found are the quote from Vicki Davis. 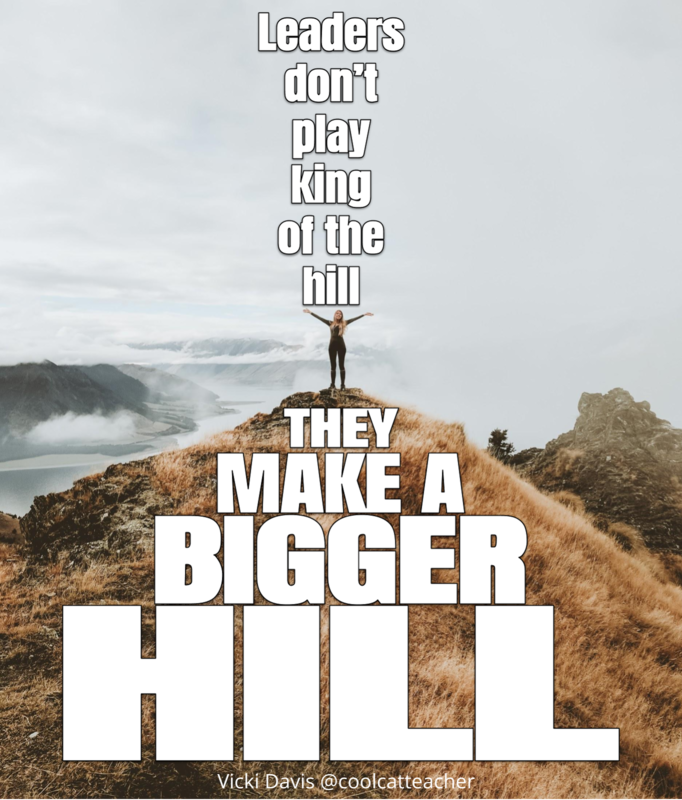 As she says, we should not try to play king of the hill, but should make the hill bigger so that more people can join us. 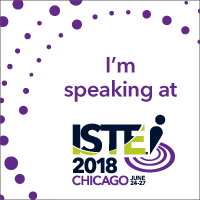 If a bunch of people are watching, the best thing I can do is take advantage of the spotlight to highlight the awesome things that other educators are doing. 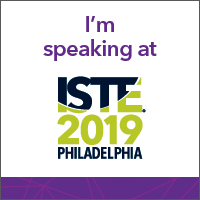 Each month I do my best to look for amazing ideas being shared on Twitter, Google+, Facebook, ISTE Communities, blogs, podcasts, conferences, and more. I then share those resources in a number of ways including my email newsletter, ELA links document, math links document, science links document, social studies links document, and more. As Spiderman says, "With great power comes great responsibility," so as educators we should use whatever amount of influence we have to amplify the great ideas being shared by others. 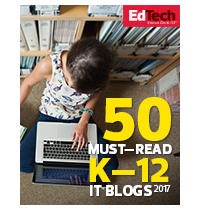 There is no room in educational technology for competition between educators. We are all on the same team. The only thing we are competing against is inequity, academic shortfalls, and lack of opportunities for our students. And when we win that battle, our students win, and gain the skills they need to reach their potentials and succeed in their futures. Now don't get me wrong. I do take pride in doing a good job. I strive to make the best blog posts, help guides, and training videos that I can. However, that same desire to do good work can unfortunately result in no work ever being done. It is easy for us to worry that what we are making is not good enough. So we don't push publish on the blog post. We don't upload that video to YouTube. We don't fill out that proposal to present at the conference. But a blog post with a mispelled word is better than no blog post at all. A tutorial video with a flubbed line (or ringing phone, or interrupting child) is better than no tutorial video at all. A conference presentation that doesn't quite click is still an opportunity to learn, connect, and grow, for both you and your audience. Each of these things has happened to me before and will certainly happen again. It's ok. We're human. I give you permission to be imperfect. But I don't give you permission to be inactive. Every one of us has something to offer that is unique to our own interests, skills, and experiences. As much as I sometimes wish there were three more of me to get everything done, the world does not need another Eric Curts. It needs you. So with the new year quickly approaching, consider if there are things you have been meaning to do, but never took the plunge. And then do it. Start (or restart) that blog, do that podcast, write that book, teach that session, run that training, or make that video. And when you do, be sure to let me know about. I am looking forward to learning from you and helping to share it with the world! What are your thoughts on these quotes? Or is there another favorite quote that has had an impact on you? Please feel free to share your thoughts in the comments below. Hi Eric, your "Done is better than perfect." meme I thought was going to make me annoyed (because we try to express just the opposite with our students) but when I read what you meant by that, I completely agree... and you may have just resparked my interest in going back to my blog I abandoned last year. Thank you for these tips, tricks and inspiration! My innermost THANKS to you, Eric, always so generous and thoughtful! It was a pleasure meeting you in Dublin at the Digital ELT Conference, and it's a renovating pleasure to read so much you share with teachers all over the world. "Mistakes are proof that you are trying". I believe we teachers should always have this quote at hand for those students who get demoralized when they make mistakes. Cheers, and thank you once again, Eric!